It looks like the 55 watt bi color is ~10000 lumens LESS than the 55 watt Daylight (or tungsten). Reference: https://www.came-tv.com/collections/came-tv-boltzen-series-lights . That seems like a lot. Anyone have any side by side comparisons of these two. Can't believe no one has done this yet, seems like it'd be a great video review. I'd love to know!!!! @Joel - I haven't run a test, but it would probably be well under an hour. I think with a 130wh V-Mount on full power you can get over 3 hours. Looking into getting some of the SWIT batteries you reccomend to use with the 55w version. Can you estimate how long they last, and how high a percentage you are powering the lights using them? You seem to have a good relationship with Came-Tv, and these LEDs look good -- but they definitely can not match the output of an HMI. I noticed on Came-TV's website they have some HMI lights. 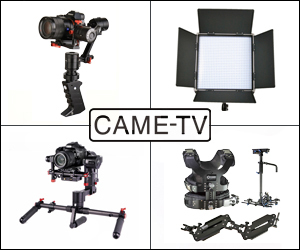 Would you be able to review Came-TV's economic HMI lighting kit? 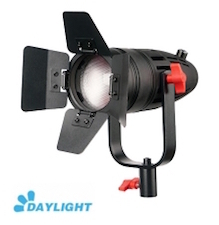 They have a 575 Watt HMI lamp that includes an electronic ballast. Do you have any experience working with their HMI lights? I've read reviews about similar budget HMI lights and all of them are pretty critical of the bulb that's included and also the quality of the ballast (as the electronics tend to fail over time). Thanks for your LED review. @David - I agree. They knocked it out of the park with this product. There are plenty of portable LED lights on the market, but not many solid spot lights at this price, with this type of power, throw, AC battery powering options, and adaptability (bowens adapter), etc. thank you for the reply. I had actually seen the app on the store prior to ordering back in mind December. Downloaded it right away not realizing at the time that a separate attachment was going to be needed. 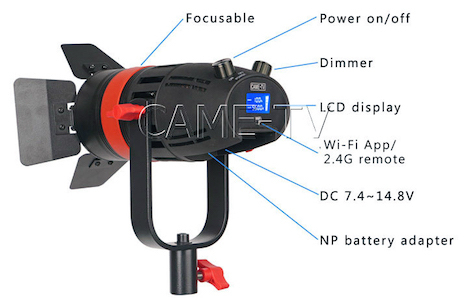 I still think the light represents an excellent value, but I wish CameTV's description on the website mentioned that the wifi controls require a yet to be released item. Would not have changed my purchase decision but I think the disclosure is important considering the images of the product highlight to a degree the wifi aspect of the light. As a side note I purchased the v-mount plate with grip they are now selling as well. 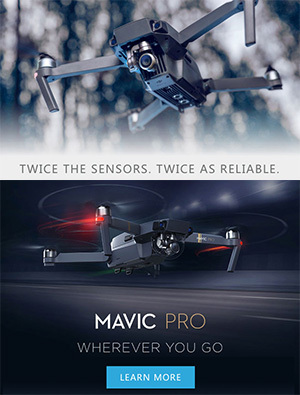 This is a great purchase for any one using v-mount batteries and the price compared to other options out there is very competitive. @David - It's going to be a Wifi dongle that you can attach to the back port. I don't know exactly if there will be a handheld remote, but there is definitely going to be an iOS app. I think if you check the Apple App store, you might already see one for Boltzen lights. This means they should have something available soon. Picked up a pair of the 55 watt lights and really loving them. Have you heard by any chance when the wifi control is going to be available? Thats the "missing link" that will make these lights perfect for me. We are using them at weddings and so being able to adjust brightness without raising and lowering them is super important. @Mark - No it does not flicker when shooting slow motion. We have used this up to 240fps without a problem. Ok great, thanks so much for your reply. Much appreciated. @Paul Harwood - I don't know how big of a space you have and how much light you need, but bouncing a light really cuts down on overall output. If the space is big you'll need some pretty big lights to bounce from a ceiling. Maybe something around a 2K light. I recently shot a video of a choir, and it was very dimly lit. I would like to invest in a light that I can bounce off the ceiling and shine on the choir. Would the 30W or 55W Boltzen work for this? I'm looking for some sort of LED. Was looking at the Yongnuo YN-300's, but 3 point lighting might be a bit difficult for this situation. If you could give some advice on what my best option would be that would be great. I appreciate your input, as well as your videos. Thanks. @AwesomeShot - Yeah I don't use the gels, even the tungsten gel they have doesn't seem to get it warm enough for me. I've been using binder clips to the barndoors and using my own colored gels. I just got my 55w unit a few days ago, and I'm running it through it's paces (and comparing it to my Dedo DLH-4). Quick question, the included frost and CTO discs have no obvious method for for attachment other than dropping them in place and screwing the accessories back on. They don't fit perfectly, they rattle loose, and seem ill-suited for quick use. Do you have any insight on better attachment methods, or should I chuck them and go with gels? @Wes - Thanks for all the info. This is the reason there are two versions of what is essentially the same led light. For people who need the simplest method, the 30w is the go to kit. For those who need more power and are understand it will take more battery power to run them, the 55w version is the way to go but still offers the same small portable form factor. The Sony battery option is great, but with any powerful light it won't ever be as bright as using a higher voltage battery. This is true for many portable LED lights on the market that offer an alternate DC input (so it's just not these lights). I've been using my SWIT batteries on these lights with a lot of success. The 55w is demanding, but remember that even running a 55w light underpowered with a battery is almost like running a 30w light at full with a battery. And because these lights are designed to throw at a distance, I find myself not using 100% power very often. But I have specific use for these types of lights, and I don't attempt to use them in ways they probably shouldn't be used (i.e. - like trying to punch through a 50" scrim, etc.). I have both 30w and 55w here and best bang for the buck is the 55w, but the 30w feels just as effective in my projects. I never really felt it was underpowered. So both are great choices, but if you want longer run times with a Sony battery the 30w would be the ideal kit. I have been looking into the powering of my 55w Boltzen lights the last few days and I hope you don't mind me posting my results from this as I think other users and potential users may find it helpful. I was originally planning on running my 55w Boltzens lights via the Sony L-Series NP-F mount on the underside of the light. However when I initially tried this with a 3rd party NPF-970 I ran into a few issues. Mainly it not powering about 70% and cutting out. I also tested this with a friends NP-F batteries namely officials Sony and a number of unbranded and 3rd party batteries and again the same issue. This prompted me to do a bunch of tests and ask a bunch of questions to Came TV and yourself Emm. So here's the findings. The Boltzens come in 55w and 30w. If powering by NP-F battery this is nominal 7.2v. Therefore the max current a battery is likely to see/deliver is 7.6A (55w/7.2v) and 4.2A (30w/7.2v). Therefore in order to to stop any of the Boltzens either cutting out or running at 100% you need a NP-F battery with a max current load of about 8A (55w light) and 4.5A (30w) light. Looking online at various manufacturers of L-Series NP-F batteries very few seem to publish max current. They tend to publish voltage and capacity mAh specs. There were a few I could find, SWIT batteries max current is 4A and RedPro 5A. I have looked everywhere and discussed with quite a few battery manufacturers and no one seems to offer a 7.2V NP-F with a max current of 8A. So in conclusion it really is not possible to power the 55w via NP-F battery at 100%. At best you can use the Red Pro and maybe get to 70-80%. However powering the 30w Boltzen lights is different and the RedPro should run at 100% and the SWIT should also get close to 100% too. This led me to looking into powering my 55w lights via the provided D-Tap cable and V-mount batteries. The difference here is obviously higher capacities but more importantly 14.4v - 14.8v nominal voltage. Which is a max current for the 55w of 3.8A for 100%. I have tested my Boltzen 55w with a couple of Rolux V-mount batteries and the 55w powered at 100% without issue and for long durations. So I have opted to use V-mount on my 55w Boltzen lights, sadly NP-F on the 55w really not a viable option. Maybe as time progresses and battery technologies improve large capacity 8A 7.2v NP-F battery may become available but until then I a sticking with V-mount. I should add that these lights are fantastic and I really like them and would recommend them, but just be aware powering the 55w version via NP-F L-Series not really viable option. However powering the 30w via NP-F L-Series will be ok. So in the end what battery did I opt for. Well thanks to Emm's review on the MAXOAK V-mount 177 I went for these batteries. Just waiting for them to arrive now. Emm thanks for all your help and input. Hope you don't mind me posting such a long comment, however I thought my findings would help so many others and save people going through the pain that I did working this out. Thank you also to CAME-TV for there input as well, who have been quick responding to answer my questions. Update: Following various discussions with CAME-TV about powering the 55W Boltzens via NP-F L-Series batteries they have confirmed the 8A requirement and as such updated their website with a very prominent statement to inform people of 8A requirement. Thanks CAME-TV for all your help and updating your website to reflect these details. Thanks for the quick reply to my battery question. Wasn't aware that some of the battery manufacturers set different current limitation safety points. I guess as none of them publish that info it's a bit of luck to find batteries which will work at 100% power level on the 55w. Thanks for the recommendations for the SWIT battery and charger too . I've been looking into batteries and really had settled on opting for a Vmount using the Dtap cable to power the 55w Boltzens and mounting the battery pack at the bottom of the stand, kind of a counter weight too. But then there's that cable dangling about hence why I kind of like the neat setup of NP-F L-series batteries. Although I like the SWIT's, that monitor and DC output jack, is there any chance you can drop any other NP-F batteries you have on the 55w to check if they work, that's would awesome? I would definitely test some better quality batteries first. Just because it is shaped for Sony, doesn't mean they will work exactly the same as other Sony batteries. Decent batteries have built in protection from too much current draw. But this is set differently depending on the battery manufacturer and is based on the types of cells used internally. Yours might be getting triggered early to protect the batteries. I myself have several different V-Mount batteries and when I use some on my strong LED Panels, the circuit breaker gets tripped. So I have to be mindful of what batteries I pack depending on what lights i'm planning to use. So not all batteries are created equal. Try a good set first and then see if there are any issues from there. The option for Sony batteries is great for run-gun setups. But even a really good Sony NPF-970 battery will only last so long on the 55w LED at full power. If you know your lights will be setup for a good amount of time, I would look into some good v-mount batteries. It's an investment upfront, but easier to manage one or two v-mounts, than dozens of individual small camera batteries. 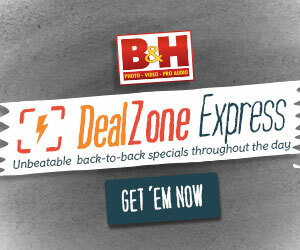 Thanks for such a great review of the new CAME TV Boltzen lights. I just got a set of 55W units and just checking them out. But having an issue with NP-F batteries 🙁 hope you don't mind me asking, what batteries did you use in your video? When I power up my 55w units via the mains adapter they work perfectly. But when I use either of my two NPF-970/960 or either of my four smaller NPF-550 they essential cut out when I turn the power up on the dimmer, can't get past about 30% and the battery level monitor shows low battery, even though they are 100% charged .I am guessing the battery packs I have are not maintaining voltage when more current draw is coming from the light and the light shuts down. The two battery packs I have are both 3rd party, Calumet and the other unbranded. Strange as the battery packs I have work perfectly in other devices and other lights. @Rene Henrich - This is a low power fesnel. You'll be asking way too much from these lights trying to add a large softbox. You will really be cutting down the light output to an unusable level. You would be better off getting the COB120 if a giant softbox is what you need. Since these lights have a Bowens-mount I planned to use them with the Aputure Light Dome (a big softbox). However, the locking screws on the Boltzen don't look like the could support a heavy softbox on the front of the light without the whole thing tilting to the front. 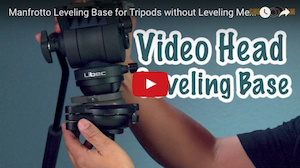 Did you test if they're locking in place as solidly as say the ones on the Aputure 120t do? I'm looking for a cheap led replacement for the Dedo light. Can you do some tests cutting some slashes on the background. How about flaging the light, how hard of an edge can you get. 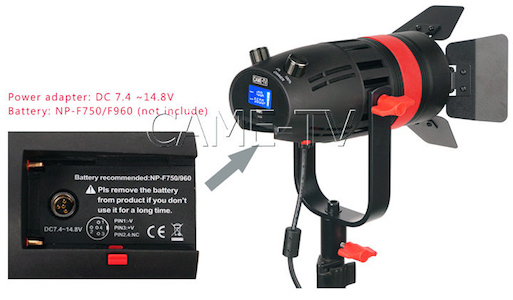 Hi Emm - Have you tested how long a 55W light last using the biggest NPF battery? And would you have a link to that battery? Hey, thanks for the review on these lights. I was waiting for something EXACTLY like this to come out to start putting together a lighting kit. Question for you though...the last important bit is wireless control. Any word on when the remote dongle/app control will be available? @Tristan - The throw should be the same, the output will be different. I think the 55w is a significant enough difference to go for that one if you plan to light from a distance. It's not much more in cost. @Gearjones - I'll keep trying to do more tests when I get back from traveling. How long would you say the through is for the 30w vs the 55w? 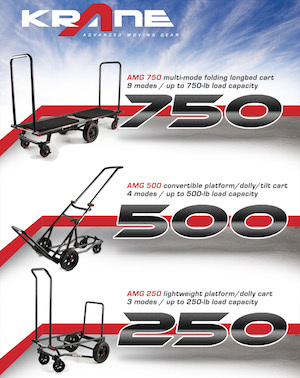 I do a lot of love events and would love to know if I could get these instead of spending a $1000 for one of the competitors. How good is the color when you use the CTO filter? Have you measured the CRI/TLCI with the CTO disk in place? Em, what's the tungsten equivalent of these? They look pretty good. @MK - What you have described with the LS1, really sounds like you want a broad soft light. These are hard spots, and although they can be diffused, it won't be near what a large LS1 can output. How does the light output compare to for example an Aputure LS1 when shot through an umbrella or other type of diffusion like a dome? @OldCorpse - Hopefully yes. The other 60W is a different form factor, more like a traditional Fresnel. I believe that 'style' design will have other options such as DMX controls, etc. Certain functions people need in a more traditional Fresnel light setup. Right now these two compact ones are more for run-gun shooters and not big studio setups in which you need to control dozens of lights. Thank you Em, for this nice overview. I went to their website and saw they also have a 60W and a 100W version of these lights. A bit odd as far as the 60W, since it doesn't seem there would be much of a jump between 55W and 60W, at least for the daylight ones. 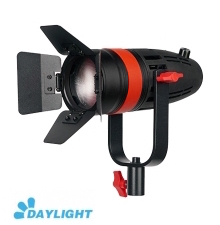 The 100W daylight version looks interesting. I'm a bit unclear on what distinction they're making between "focusable" and "adjustable". Are you going to do a review of any of the other in the same series by any chance? Thank you for all your work!